Evangelist Billy Graham, "America's Pastor," died Wednesday at his home in Montreat, North Carolina, at the age of 99, leaving behind a legacy of humility, faith, and service. The spiritual counselor to a number of presidents, including Lyndon Johnson, George W. Bush and Bill Clinton, Graham is credited with bringing more than 3 million people to Christianity. 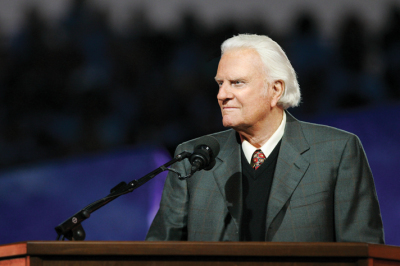 The preaching of the world-renowned evangelist was heard in 185 of the world's 195 countries, and prior to his death, the legendary evangelist had written 32 books, according to the Billy Graham Evangelistic Association. Throughout his ministry, Graham often spoke of his hope of Heaven: "The most thrilling thing about Heaven is that Jesus Christ will be there," he said. "I will see Him face to face. Jesus Christ will meet us at the end of life's journey." Here's a list of 10 facts you might not have known about the Southern Baptist minister.